You just bought a Surly? Congrats. We're confident you’ll like it a lot. Maybe your new Surly is your first steel frame and you’re discovering what we’ve been preaching for years: steel has a special ride, snappy, comfy. With a bit of care, it'll ride the same in 20 or 30 years as it does now. The first thing that should be done to all frames, not just ours, is to have it prepped by a competent professional. It’s a good idea to face the head tube, fork crown, and bottom bracket shell (where the crank bearings fit). Facing removes excess paint and metal, making the tube end surfaces parallel, thereby ensuring that all the pieces of the headset or BB square up and operate smoothly without 'hotspots' of excess pressure and friction which can ruin bearings prematurely. On Surly frames it is usually not necessary to remove much (if any) metal, just the paint. Done wrong, facing can remove too much material (metal that used to be your BB shell or head tube). This can be especially harmful to outboard-style bottom bracket bearings, which require proper width spacing to adjust properly. Again, this work should be done by someone who knows exactly what they're doing. Many headtube facing tools are also reamers. This means that not only do they shave the tube ends, they also mill the inner circumference of the headtube. Reaming is not generally necessary on good quality frames (such as ours), on which manufacturing tolerances are kept in check, unless there is excess paint inside the headtube. Reaming is probably not harmful if the tools are sharp and of high quality, and if performed by someone with experience. All that really needs to be done, however, is the facing itself. Since Surly frames are faced prior to painting, it is possible to shave the paint off the head tube and BB shell ends with a carpet knife blade. This usually results in an acceptable result, saving you money, but we still recommend having it done the proper way to ensure longest life from your components. Next, examine the bottom bracket shell. If there is excess paint on the threads, have them chased with a BB thread cutter. Do the same thing with the derailleur hanger threads if your frame has a hanger. You may want to face your disc caliper mounting tabs too. Facing the tabs provides a flat, even, straight surface to attach the caliper to. Most disc calipers these days have a lot of adjustability built into them, so facing is not really necessary. Also note that it only works on single-position mounting plates. At this point you can install all the parts if you so choose, but we recommend also protecting the inside of the tubes. The outside of your frame is covered with a tough coat of paint. Even when you get dings in the paint, rust never gets too far because the surface has a chance to dry, so you don’t really even need to touch up scratches (of course, if you leave it outside under a tarp, it’s going to rust more than if you get it out and ride it). 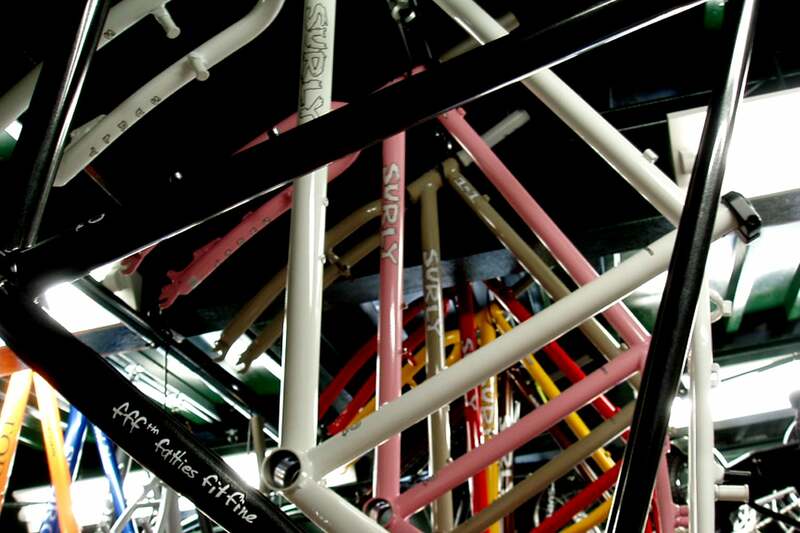 The inside of the frame tubes, however, are a rust breeding environment. Water gets inside your frame. It does. It can seep into the smallest places, like down your seat tube as water sprays up from your wheel. See the little holes the inside of your chainstays? They’re there to allow gasses to release when the frame is being welded, but they also serve to allow some airflow in the tubing. That’s great, but it isn’t enough. It’s a really good idea to coat the insides of the tubes with some kind of protectant. This is best done, obviously, when the frame is still naked, without any components installed. After the initial frame prep, get yourself some JP Weigle Frame Saver or motor fogging oil or boiled linseed oil. Any of these are a kind of sticky oil that coat the insides of the tubes and prevent rust from starting. Frame Saver is a bit toxic, as it comes in an aerosol can, but it has a spray nozzle that lets you easily get into the nooks and crannies on your frame and comes with complete instructions. One can should let you do 3 or 4 frames on average. But whatever you use, go one tube at a time. Spray some in according to the instructions (or a little more than you think you need) and roll the frame around so it coats the entire inside surface. Make sure you remember every tube , including the head tube and fork legs. Let it air out and gel up for a day or so, then clean up any extra on the outside of the frame. Add a light coat of grease to the BB threads, the ends and inside of the head tube, and the seat tube, then install your parts and go ride.